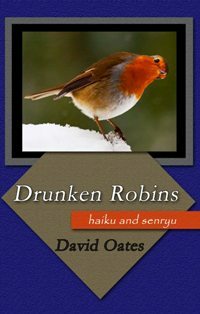 Drunken Robins is a new collection of haiku and senryu from poet David Oates, collected over the last twenty years of living in rural Appalachia and Athens, Georgia, where Oates is a teacher and public radio host. By his own account, Oates's work adheres to the philosophy of the poet Basho in that he tries to write, not as if he were in medieval Japan, but rather drawing inspiration from nature and the life that surrounds him. Haiku and senryu are deceptively complex Japanese forms, owing both their gracefulness and impact to their brevity. The economy of words that governs the forms demands a reductive discipline which forces the poet to strip away everything but the most precious morsel of truth. Although the effect defies the formal rules of haiku, the poem is nonetheless pleasing and offers the reader the surprise that is so important to a strong haiku.